If you’re having trouble sleeping and it’s not so easy waking up, you could use this combination gadget to help. It’ll coax you into a deep sleep, as well as make sure you come back out of it at the proper time in the morning. 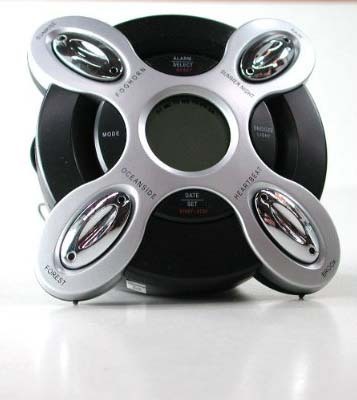 Plus this odd looking gadget has a way of making your nightstand look a whole lot more interesting. The clock shows the time, date and day of the week much like any other simple clock you can get out there. It also lets you fall asleep to the peaceful sounds of the ocean, waves, forest, brook, heartbeat and 3 others. It’ll also let you listen to both AM and FM radio, plus it has your usual snooze button for when you’re not ready in the morning. You can purchase it for £19.99 or about $30 through Amazon.